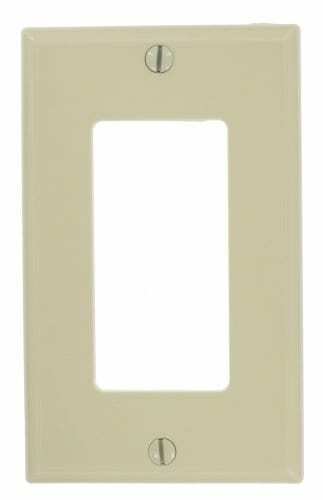 The Leviton 80401NI is a Decora/GFCI wall plate in ivory. Leviton Decora designer and Decora Plus wall plates are available in a large variety of colors and styles. Add an elegant touch to your home with Decora wall plates, or go modern with Decora Plus screwless wall plates. They feature a midway size that not only provides greater coverage, but also hide wall surface irregularities. The installation process is fast and flawless. All Leviton wall plates are constructed to stand up to heavy use. We have many variations of wall plates that you can match to the color of your wall or wall plates.